This stunning tropical bouquet really is fit for a queen. It's an elegant mix of rare and tropical flowers that makes a eye-catching addition to a modern home or an outstanding display for the office. The large and lovely bouquet is an exquisite mix of flowers such as hydrangea, cymbidium orchids, mokara orchids, 40cm roses, and much more. 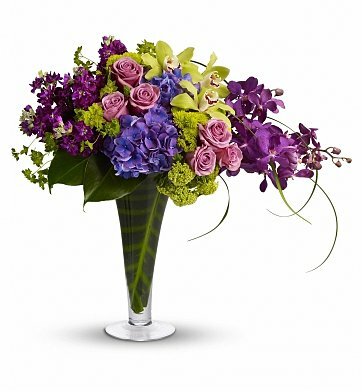 When delivered in a contemporary, leaf-lined vase, the regally colored bouquet is sure to make magic happen for her majesty! Measures approximately 23" x 21". if ordered by 5:00 pm EDT Saturday April 27th. Your Majesty Bouquet is a hand delivered gift. These gifts are delivered by one of our local design centers located throughout the United States and Canada. Same day delivery is available for most gifts when ordered before the cutoff time. The cutoff time for Your Majesty Bouquet is 2 PM in the recipient's time zone.